With two massive announcements already made for the RED HOT SUMMER TOUR in 2019, festival promoters have organised an incredible line-up for the highly anticipated Series Three. 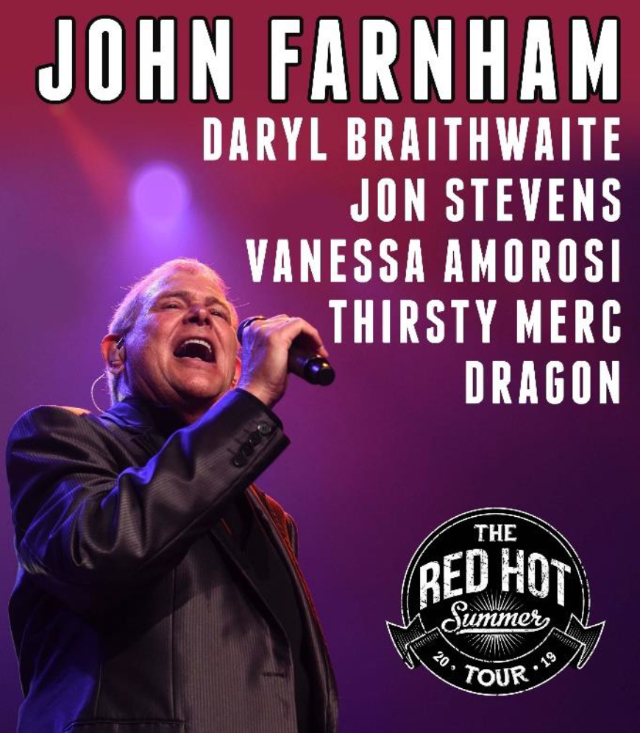 Headlined by the legendary John Farnham, with special guests Daryl Braithwaite, Jon Stevens, Vanessa Amorosi, Thirsty Merc and Dragon, these select shows were hand-picked for the final run of the 2019 festival. The special dates were by popular demand, after an incredible sell-out series with John Farnham in 2018 there simply just had to be more when the festival returned in 2019. The RED HOT SUMMER TOUR series featuring John Farnham in 2017 and 2018 sold-out and the 2019 run will no doubt do the same. Revered as one of the best male vocalists – by both fans and fellow musicians – he has had an incredibly versatile career. His 1986 album Whispering Jack was the first record to sell over a million copies in Australia and its chart topping single You’re The Voice cemented the honey toned solo artist as ‘the voice’ of the country. Over the next several years he released hit after hit, including Pressure Down, Reasons, A Touch of Paradise, Age of Reason, Two Strong Hearts, Angels, Talk of The Town, Chain Reaction, Burn For You, Have A Little Faith (In Us) and That’s Freedom to name a few. Audiences will have the chance to celebrate five decades of great music when John takes to the stage for these select shows in 2019. A long-time supporter of the RED HOT SUMMER TOUR, Daryl Braithwaite always puts on an incredible performance – it’s why his return to the line-up is highly anticipated. He is one of the most recognisable voices in the Australian music scene, and with a diverse career that has spanned decades. Daryl’s consistency as a performer has never wavered, something that sees him performing regularly to packed crowds around the country. Starting his career in the 1970s as the frontman for Sherbet, Daryl was crowned King of Pop and the band produced 20 national Top 40 singles. In the 1980’s Daryl set out on his own solo career, releasing smash hit singles such as One Summer, As The Days Go By and Sugar Train to name a few. His anthemic version of The Horses is always a crowd- pleaser and a favourite for RED HOT SUMMER TOUR fans. For lovers of great music, a concert experience with Jon Stevens is up there with the very best. From his Noiseworks days – and hits such as Welcome To The World, No Lies, Touch and Hot Chilli Woman – to fronting The Dead Daisies and INXS, he has made an indelible impact with his amazing vocals. Jon also has an incredible solo catalogue, the most recent of which Starlight saw him do a run of sold-out dates last year. His live shows are dynamic, high energy and will keep audiences on their feet. Music fans are in for a treat as Jon takes RED HOT SUMMER TOUR audiences through his repertoire in 2019. It has been seven years since Vanessa Amorosi has performed as part of the RED HOT SUMMER TOUR and audiences are certainly in for a treat. Considered one of Australia’s most iconic female voices, the festival sees the soulful powerhouse performer return to her live roots. Her debut album The Power (2000) demonstrated Vanessa was a force to reckon with – it notched up six nominations at the ARIA awards and saw her sing at the Sydney Olympics. It was the breakthrough Top 10 hit Absolutely Everybody that made her a household name, it stayed in the charts for six months, went certified double platinum and charted in Europe. She continued to demonstrate her versatility as a soul, R&B and rock performer with albums Somewhere In The Real World (2008) and Hazardous (2009). She has sold over two million records and heads into 2019 with a renewed focus on music and live shows, kicking off with the RED HOT SUMMER TOUR. It’s hard to believe it has been over 15 years since Thirsty Merc smashed onto the scene with his such as Someday Someday and In The Summertime. Lead singer Rai Thistlethwayte proved himself to be a world-class songwriter and the trio performed far and wide. Having recently celebrated their 15-year anniversary with a national tour, the return of Thirsty Merc on the festival circuit will be embraced by audiences. The band were last part of the RED HOT SUMMER TOUR in 2011 where audiences delighted in their performances. When it comes to iconic bands, Dragon has a long history with Aussie music fans. Moving from New Zealand to Australia in the 1970s, the Kiwi-come-Aussie band made an indelible mark and their music captured the hearts of a generation. Songs like April Sun in Cuba, Are You Old Enough, Still In Love With You, Young Years and Rain became ingrained into the Australian psyche. They were an institution on Countdown. Fast forward more than 45 years and audiences still can’t get enough of Dragon – with Todd Hunter still on bass and fellow New Zealander Mark Williams on vocals, the reformation of Dragon has seen a whole new generation of music lovers introduced to their music and loving it. The RED HOT SUMMER TOUR is always a sell-out series. The 2018 run saw many of the shows sell-out several months before and tickets are always coveted. Don’t miss out on tickets to the 2019 tour – these shows are what music memories are made of! Tickets are on sale at 9am AEST on Thursday 19th July 2018. Tickets are only available through authorised ticket outlets listed. Patrons are advised not to purchase tickets from Viagogo or other Third Party Sellers, as fraudulent tickets will not be honoured. Please only use the authorised sellers listed below.